Through an intimate narrative of the life of painter John Singleton Copley, award-winning historian Jane Kamensky reveals the world of the American Revolution, rife with divided loyalties and tangled sympathies. Famed today for his portraits of patriot leaders like Samuel Adams and Paul Revere, Copley is celebrated as one of America’s founding artists. But, married to the daughter of a tea merchant and seeking artistic approval from abroad, he could not sever his own ties with Great Britain. Rather, ambition took him to London just as the war began. His view from abroad as rich and fascinating as his harrowing experiences of patriotism in Boston, Copley’s refusal to choose sides cost him dearly. Yet to this day, his towering artistic legacy remains shared by America and Britain alike. 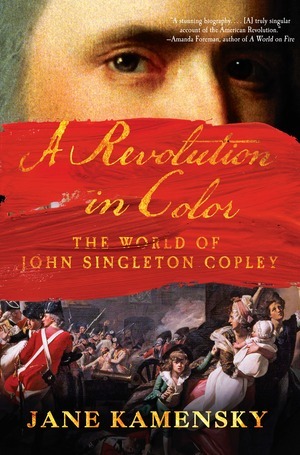 “Beautifully written and elegant, A Revolution in Color gives us a vibrant and new perspective on the conflict between America and Great Britain, a conflict the ambitious John Singleton Copley embodied. Jane Kamensky enriches our understanding of this vital time in world history.” — Annette Gordon-Reed, author of "Most Blessed of the Patriarchs"